Latest studies have once again proven that regular consumption of apples can effectively lower cholesterol and keep cardiovascular diseases at bay. Eating at least an apple a day is said to help adults over 50 years of age, to live longer. The study by Oxford University, UK, claims that prescribing apples to everyone over 30 years of age is associated with 30 percent reduction in vascular deaths. The study shows that apples can be as effective as drugs in preventing heart diseases and stroke. While the age old saying that “an apple a day keeps the doctor away” holds good even now, Ayurveda emphasizes that it is the ‘cooked’ apple that keeps the doctor away, as raw apples can be cold and drying and may not digest as easily, particularly if un-skinned. Cooked apples are warm, soft, and like soups, digest easily. Applesauce may taste sour, but, the taste increases saliva and stimulates digestive tract, cleanses liver, and cools the blood by drawing bile out of the body into the small intestine. Apples, with its comparatively low glycemic index and calorie count, can also be consumed by diabetics in moderate quantities. The high fibre content bulks up stool for an easy elimination, cleansing the colon. Apples are good for people with pitta and kapha constitution, but, may be too drying for vata, unless it is well cooked and spiced. 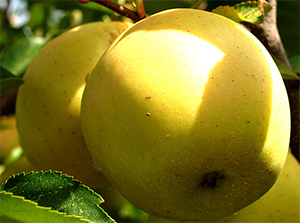 Although raw apples stimulate Vata, it relieves constipation, bleeding gums and excess salivation. In Ayurvedic healing, apples are also used as medicine. For instance, to stop dysentery and diarrhoea, peel and cook apples until soft. Add a pinch of nutmeg, saffron and a teaspoon of ghee, and consume. Ayurveda suggests chewing apple an hour after meal, to regularize bowels, and clean teeth and tongue. Apple juice is particularly helpful for burning sensations in Pitta conditions such as Colitis, gastritis, and bladder infections. Beginning the day with a stewed apple, helps build appetite for lunch, stimulates regular bowel movement, increases vitality and offers a light satisfying start to the day. To prepare apple juice, blend the apple and extract the juice. Add about 30ml of honey (for 1 fruit) and add desired quantity of water and stir. Apple juice, when consumed with honey, cures conditions such as gout, anaemia, skin diseases, digestive disorders, obesity, dental problems, cold, asthma and relieves stress. Apple juice also helps nerve and brain tonic, regulates menstruation, stops excessive bleeding, is a rejuvenator (Rasayanam), and is an aphrodisiac (Vajikaram). Apples also make an excellent winter dessert. The Ayurvedic preparation method suggests dicing one whole fresh sweet apple (cored and peeled). Add the diced apples, 5 whole cloves and quarter cup of purified water in a covered pot and cook apples until they are soft. Discard the cloves, cool slightly and enjoy. This preparation also boosts immunity and enhances energy during winter.